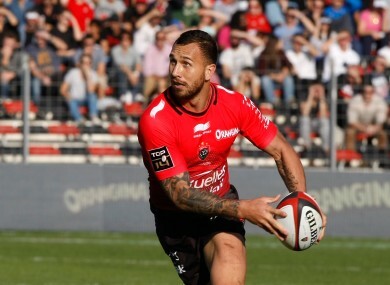 TOULON HAVE MADE fly-half Quade Cooper available for selection in the Australia sevens team at the Las Vegas World Series event early next month. The French club have agreed to release the 27-year-old for the event as the 58-Test veteran looks to improve his chances of making the squad for the Rio Olympics later this year. Cooper recently attended the Sydney Sevens after being given time off by Toulon but despite making the long-haul dash, he was left out of the Australia squad because coach Andy Friend deemed he was not ready. However, that didn’t stop the talented ball-player from catching up with fellow Rio hopeful Sony Bill Williams, who was in action for New Zealand. A number of high-profile 15-a-side players have put their hand up for Olympic selection with South African flyer Bryan Habana another in contention. Toulon have also approved the release of the 2007 World Cup winner for the North American legs of the World Series, in Las Vegas and Vancouver. Email “Toulon release Quade Cooper to make sevens bow in Vegas”. Feedback on “Toulon release Quade Cooper to make sevens bow in Vegas”.